For Mew2King's YouTube channel statistics and videos, see Mew2King on Let's Play Index. Jason "Mew2King" Zimmerman is an American competitive Smash player from Cinnaminson, New Jersey, currently playing for Echo Fox. He mainly plays Melee as Sheik, Marth, and Fox, but competes in tournaments for every Smash game from time to time. He made many important discoveries about the game through his own testing of game mechanics, including character weight, falling speed, knockback, priorities and game physics. 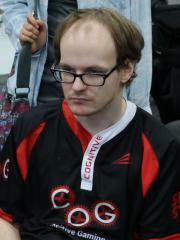 Mew2King began competing in tournaments in 2005 at the age of 16. In 2006, Mew2King went from being relatively unknown in the competitive scene to being one of the best Smash players at the time. By 2008, he was considered to be the best Melee and Brawl player in the world, taking numerous victories at events such as Cataclysm 3, MELEE-FC Diamond, Super Champ Combo, Event 52 - Kansas, and many others. Mew2King and ADHD were banned by from competing at MLG Dallas 2010, after an official investigation of the two allegedly conspiring to manipulate brackets in the Brawl event at MLG D.C. 2010. The ban came after ADHD had stated he paid Mew2King $300 to lose the loser's bracket final. From 2010 through 2013, his performance dwindled and he began losing to newer rising stars in the scene. Though he still managed to win at a few smaller events, he struggled in the more prestigious nationals. Later on in 2013, after years of not winning a major Melee event, Mew2King went on a winning streak where he won almost every singles event he entered, taking sets off of players who he had seldom defeated in recent times, including Mango, Hungrybox, and PPMD. This is commonly referred to as "The Return of the King." Mew2King had entered fewer tournaments in 2015, even skipping EVO 2015 entirely due to serious hand pain as well as lack of confidence in his play. Mew2King is currently considered one of the "Gods" of Melee competition along with Mango, PPMD, Armada, and Hungrybox. Mew2King is currently ranked #345 in highest overall earnings, and #57 in highest earnings for players from United States. Before his 18th birthday, Mew2King was awarded $8,203.00 in cash prizes from 15 tournaments. 3.01% of his total prize money was earned before February 5, 2007. The largest cash prize that Mew2King has been awarded from a single tournament was $7,703.50 from Smash Summit 6 (Singles) on May 6, 2018. His 1st place finish makes up 2.83% of his total prize money won. Mew2King obtained $100,000 in total prize money earned on July 6, 2014 with a $97.50 cash prize from his 1st place finish at Kings of Cali 4 (SSBM Doubles). Prize money from 308 tournaments got him to that point. In the last 90 days, Mew2King has won $635.50 in cash prizes from a single tournament, none of which came in the last month.